The opportunity to represent Russia at the world scientific fair IntelISEF was won by students at the XIV Baltic Science and Engineering Competition on February 6-8, 2018 in St. Petersburg. 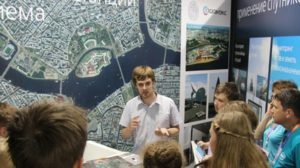 The Baltic Science and Engineering Competition has been held in St. Petersburg since 2005 and is one of the largest scientific competitions for schoolchildren in Russia. More than 300 young scientists from different cities of Russia take part in the competition. The children present their projects in the fields of mathematics, physics, chemistry, engineering, physiology and medicine, ecology, biology, programming, robotics and earth sciences. The main prize of the contest is a trip to the USA to the world scientific fair IntelISEF. Intel International Science and Engineering Fair (Intel ISEF) – the world competition of scientific and engineering achievements of schoolchildren, annually takes place in the USA and is coordinated by the authoritative non-profit organization Science Service. The event invariably gathers more than 2000 participants from more than 65 countries of the world. The project “Modeling of floating objects on the sea surface” received a diploma of the 1st degree and the Main Prize – a trip to the USA for the IntelISEF competition in May 2018. The work, carried out under the guidance of Natalia Yevtushenko, a specialist of the ScanEx Navigation Satellite Monitoring Group, was represented by Elena Kovalchuk (Balakovo) and Oleg Kirillov (St. Petersburg). The second project – “Assessment of the anthropogenic pressure on the Russian part of the Black Sea” – was represented by Sofya Antipova (Ulyanovsk) and Anastasia Sirotina (Novy Urengoy). It is development with support by Karina Nikitskaya (Institute of Water Problems of the Russian Academy of Sciences). The work of schoolchildren also was awarded a diploma of the 1st degree and a sectional award “Perfection as Hope”. The children started working on the projects during the participation in the program “Big Challenges” of the Sirius Educational Center with support of ScanEx, the Fund for the Promotion of Innovation, the “Future Education” Company and the Research and Production center “Small Space Vehicles”.